Each of us can make the world a brighter place. The trick is to bloom right where we are. The journey of the dandelion seed is our journey, filled with challenge, wonder and beauty. Its story is a mystery too great to fathom, told so even a child can understand. Who we are. Why we are here. Where we come from and where we go. Every child ponders life's greatest questions. Here, in a nutshell, is a tale about life. A novel about finding what it takes to change the world. Thea wanted to change the world. What she learned was that she could. I had been writing a story that bogged down and finally came to a dead stop. I liked the story but didn't love it anymore; however, through the writing process the main character had taken on a voice of her own. 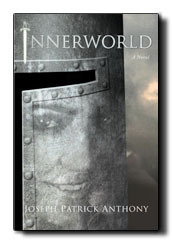 She is the one who began writing 'Innerworld'. It was her story. Thea and I fought and argued our way through the medieval world erupting from within her own mind, trying to come to grips with the truth of her journey. It was an amazing transformation for us both and represents one perspective on the archetypal journey of the soul. I really am grateful for being able to offer a story appropriate for young adults who are in the midst of their own initiation experiences and who may find in Thea's conflicts the seeds of understanding their own.